Looking for that perfect out of the ordinary gift for someone special? Stumped for a birthday, holiday or “just because” kind of gift? Give the gift of Spiriual knowledge to the person(s) who has everything! The gift of knowing and having a glimpse into the future can empower a person’s decisions and change their life for the better. I will customize and send you a gift certificate with the recipients name and your name as well. Gift Certificates can be purchased year round! All gift certificates are honored for up to 6 months after the sale of the gift certificate. A Holiday Gift of Wisdom! It’s that time of the year again where we think about giving something special to those that we love. Do you have someone that is difficult to find a present for? Looking for the perfect out of the ordinary gift for someone special? Give the gift of clairvoyant psychic knowledge to the person(s) who has everything! The gift of knowing and having a glimpse into the future can empower a person’s decisions and change their life for the better. Purchase a Psychic Reading gift certificate before December 31, 2013 and you will receive a FREE copy of my booklet “The No Willpower Weight Loss Program.” This will help you if you happen to add some extra pounds over the holidays. You’ll be ready to get going after the New Year! May Your Holidays Be Blessed With Abundant Wisdom. With the change of seasons come life-changes you need to be prepared for. Love, money, career, and other factors are constantly shifting. 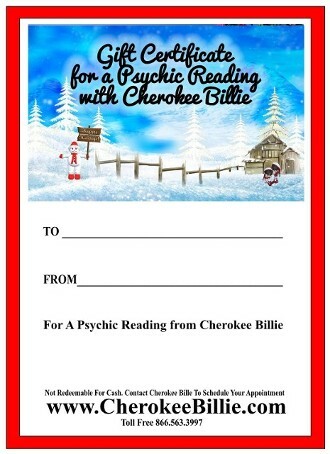 Let Cherokee Billie guide you with her clairvoyant insight – and for a limited time, get 20% off your next call! This offer ends September 04, 2012. This offer only applies using Google Check Out. You do not need an account, just a credit card.